I have been wanting to let Capri paint for a while now, but I just have not gotten around to it. So last week I bought a canvas from the dollar store for $2 (it is a big one) and today I made some homemade paint using this recipe (the picture to the right is the recipe and also her picture). I used too much cornstarch in mine and it was kind of goopy, but she suggests on her blog to just water it down if it is, next time I will do that. Also I ran out of red food coloring while making it so we only had pink paint to work with (I wanted a pink and red). 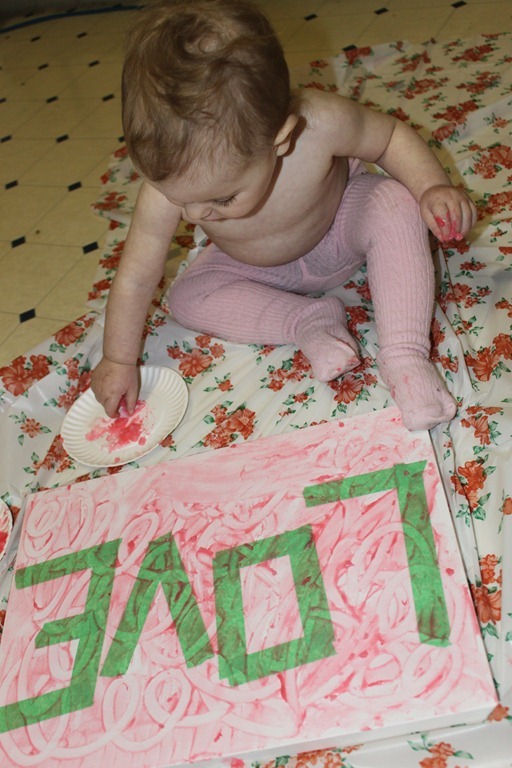 So we set up our splat mat (aka table cloth form the dollar store), and I put some finger paints on paper plates for Capri to dip her fingers into. 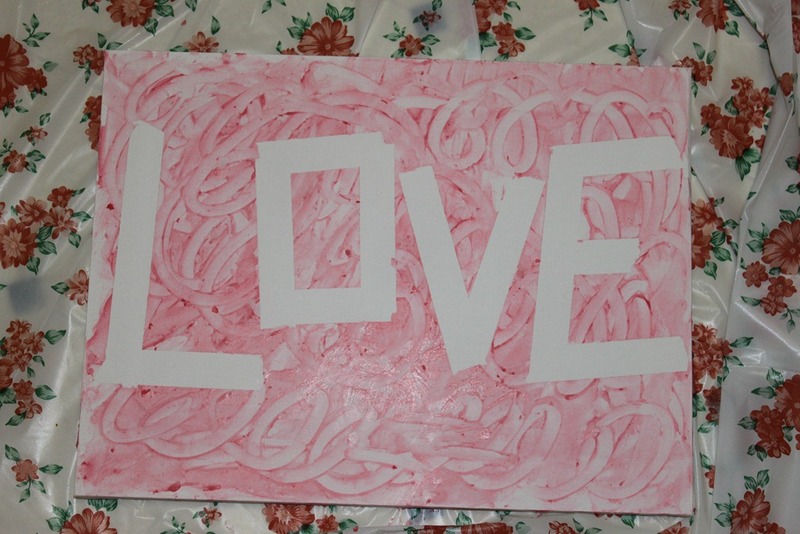 I used painters tape to write the word LOVE on the canvas and we went to town. I helped because she was more interested in eating the paint (which I didn’t mind too much since it is all cooking ingredients anyway). She got the hang of it after a while and really started going to town. Also don’t you love my child’s face??? When she sees a camera she HAS to smile like this, I am not sure why. She smiles perfectly nice when there is no camera around. This is adorable! So cute! And I adore her cheesy little smile! My daughter smiles just like that when I get out a camera as well! They look pretty close to the same age…think I’m going to do this with her this weekend! Looks like a fun task! Adorable! This is absolutely awesome! My son is 7 months old and I’d love for him to do this…just not sure he’s quite ready. How old is your daughter in these photos? My husband and I have been fostering a baby girl named Serenity since she was born. She fixing to be adopted and I’m going to miss her bunches. So I think I’m going to do this with her name so we’ll have a little something of her left behind! that is such a great idea. And that is awesome that you are foster parents. That must be one of the hardest but rewarding jobs. It’s so wonderful that you two are foster parents. What a wonderful idea to do her name. I can’t imagine having to let a li’l one go, my hats are off to you both, Megan Sunshine. I let it sit over night because there were some thicker clumps. This is wonderful!!!! How long are you able to store the finger paint? Would you put it in the refrigerator? Umm I only made enough for that project. But I think it would last a week or so in the fridge. We’re working on this, but I can’t get the tape to stay stuck on the campus. I’ve tried both painters and masking tape , and it curls right off. What kind of tape did you use? Is it that frog tape? it was just painters tape from wal-mart. I had to really press down on it to make it stick. I think if you held it down and painted over it a bit first it would help hold it down. Sorry it is not working for you. I had the same problem with the tape, even bought the expensive stuff. Did you get it to work? If so with what and how? I think we bought the cheapest one from wal-mart. Sorry it is not working. I am going to feature this on my ” Words I wish I wrote” series. I hope thats ok. Please let me know if its not. Hi Kristen, you can but I would LOVE it is you linked back to my new blog address instead of this address. The link is here http://astimeflies.ca/?p=901 that would be great. I want to do this with my 8 month old son. Im trying to think of other things to write on it that would be a little more boyish. lol I want everyone to be able to hang it up all year round also. 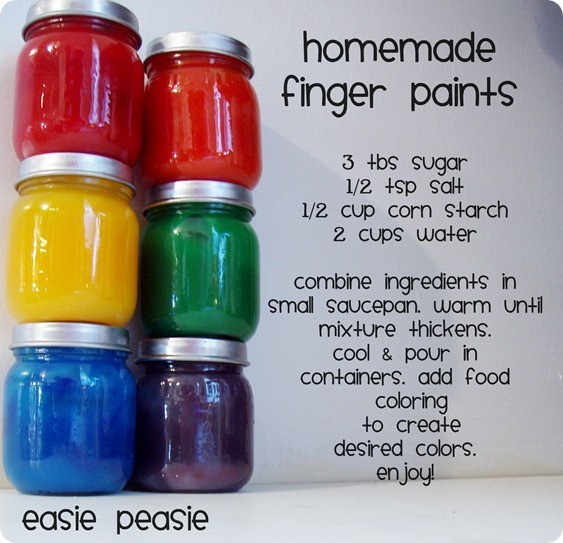 love the idea…I’m wondering about the food coloring. does it stain the hands? how many drops food you use? I don’t remember it staining her hands. I used a fair amount of food coloring because I was trying to get it darker. I am planning to do this tomorrow with my class …the kids are 1-2yrs old. I am trying to find out whether finger paint is ok/lasts on canvas rather than the acrylic paint that is normally suggested. If it works we are then going to auction it for our preschool annual auction 🙂 so thanks for the suggestion !! 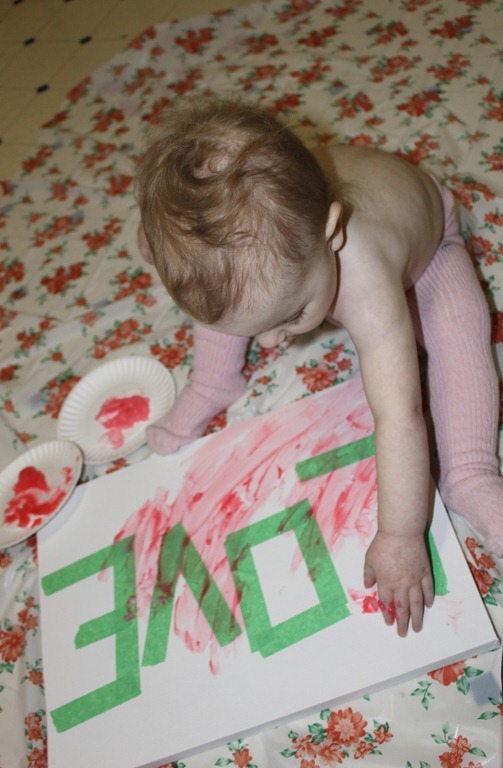 Ours still looks great a year later with the finger paint we used. Brilliant thanks so much !! It’s so cute! I like it! Can’t wait to try this! They are going to be Mother’s Day gifts!!! We are going to do this for Daddy for Father’s Day! I have three little ones and I am going to spell out We Love Daddy! I am so excited!!! I am having my daughter paint one that says DAD for Father’s Day and letting my 13 year old write Happy Fathers Day on it so they both contribute. My daughter did this with her children. Priceless art work treasure forever. Love this Idea, I did the word ROCK to match my sons theme of his room and added a few stickers, guitar, stars and music notes and let him paint over them also! It turned out cute although he hates when anything gets on his hands so we used a brush! thanks for the idea! What dollar store was the canvas from? Thanks so much! Oh darn! Don’t have that here. Thanks for the quick reply.